World Rhino Day is September 22nd and Save the Rhino Day is May 1st! A Black rhino can run up to 40 mph...on its toes! About 50 pounds of manure is produced by an adult white rhino EVERY day. A white rhino isn't really WHITE. It's name comes from an Afrikaans word meaning wide(for its mouth). The word is wyd. White rhinos are really grey. A black rhino isn't really BLACK. Also a grey/brownish color, it got its name for the dark wet mud that they often have covering their bodies. Did you know that a rhino is a relative of the zebra, tapirs and horse? After the elephant, the white rhino is the largest land mammal. A white rhino can weigh up to 5000 pounds. Eating only plants, a rhino is a HERBIVORE. The horn of a rhino is not ivory but keratin, a material found in fingernails. Rhinos have VERY bad eyesight! They do have great hearing and a great sense of smell. Use a world map and have students locate the areas of the world where rhinos live in the wild. (Rhino can be found in Africa countries including South Africa, Namibia, Zimbabwe, Botswana, Tanzania,Kenya and Uganda. They can be found in India, Pakistan, Bangladesh and Burma, Nepal and Vietnam. Rhinos are found on the island of Java. There may still be rhino in Sumatra and Borneo. 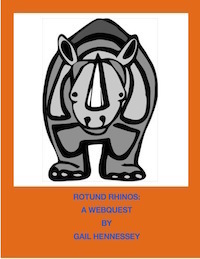 Write a Day in the Life of a rhino. What did you do? What did you see? Feel? Smell? Read an interview with a Rhino ranger/keeper: http://www.animalanswers.co.uk/blog/interview-with-a-rhino-ranger/" Pretend you work with rhinos and write a diary, including 3 facts learned about rhino. Make a poster and share 3 facts about the rhino to create awareness for Save the Rhino Day!